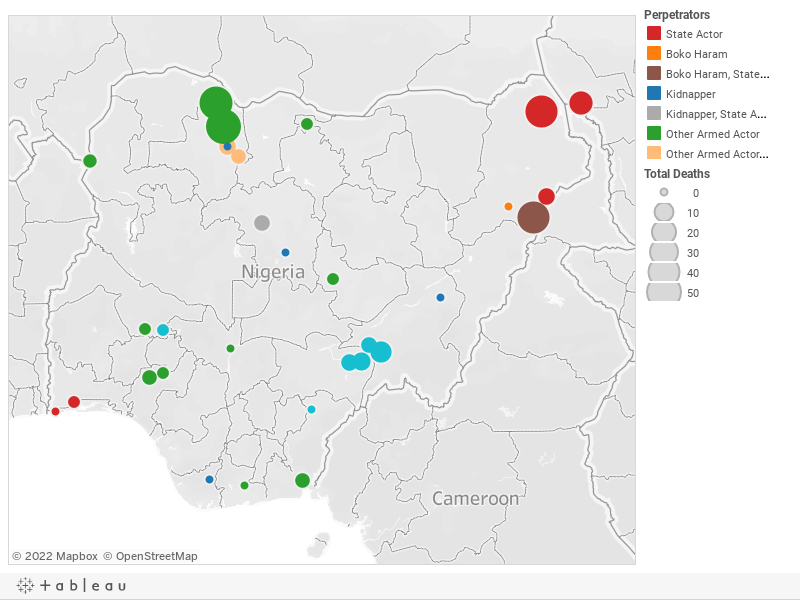 Below is a visualization and description of some of the most significant incidents of political violence in Nigeria from March 30 to April 5, 2019. This update also represents violence related to Boko Haram in Cameroon, Chad, and Niger. These incidents will be included in the Nigeria Security Tracker. March 30: Nigerian troops killed "scores" (estimated at forty) of Boko Haram militants in Michika, Adamawa. March 30: Nigerian troops killed one bandit; two vigilantes were also killed in Tsafe, Zamfara. March 30: Bandits killed forty-three in Shinkafi, Zamfara. March 31: Nigerian soldiers killed sixteen Boko Haram militants in Lake Chad. March 31: The Nigerian Air Force killed five bandits in Gusau, Zamfara. March 31: Kidnappers abducted twelve firewood traders in Birnin Gwari, Kaduna. March 31: Sectarian violence led to one death in Oke-Ero, Kwara. April 1: Thirty-seven commuters were kidnapped in Kachia, Kaduna. April 1: Boko Haram attacked Chibok, Borno. No casualties were reported. April 1: The Nigerian Air Force killed "several" (estimated at five) Boko Haram militants in Gwoza, Borno. April 1: Sectarian violence led to four deaths in Wukari, Taraba. March 29–April 1: The Islamic State claimed to have killed thirteen Nigerian soldiers around Kukawa, Borno. April 2: Sectarian violence led to twelve deaths in Donga, Taraba. April 2: Herdsmen killed five in Logo, Benue. April 2: Bandits killed fifty civilians and Civilian Joint Task Force (CJTF) in Kaura Namoda, Zamfara. April 3: The Islamic State claimed to have killed five Multinational Joint Task Force (MNJTF) soldiers around Kukawa, Borno. April 4: Sectarian violence led to seven deaths in Ukum, Benue.